As you may know, the Phoenix Suns have a pretty good starting backcourt when healthy: Brandon Knight, Eric Bledsoe. But watch out Phoenix, there may be a new sheriff in town. Let’s go back. Before the 2015-16 season began, there was a draft, and on draft day a guy by the name of Devin Booker (6’6″ out of University of Kentucky) was selected in the first round, 13th overall. The guy could flat out shoot the ball, he was called a pure shooter throughout his entire organized basketball stint. Booker was picked by Phoenix and for a while he wasn’t seeing much court time, averaging just 12.2 minutes a game in the month of November and a slight boost to 19.2 minutes a game in December. However, how unfortunately-fortunate was it for the Suns to lose starting guard, Eric Bledsoe, to a knee injury for the rest of the season? It was in a home game loss against Philadelphia in the tail end of December, but it created the opportunity to watch 19-year-old Devin Booker develop. Since Bledsoe has been out, Booker’s minutes have skyrocketed to 34.8 minutes a game and his USG% (Usage rate) has also seen a serious increase from 17.9 to 29.8. The 6’6″ shooting guard is also producing in the box scores. He’s gone from 7.6 points a game to 17.3 points a game in January, 13.5 points a game in February and 22.4 points a game in March. Booker also became the third-youngest player in NBA history to achieve a 30-point game behind LeBron James and Kevin Durant. 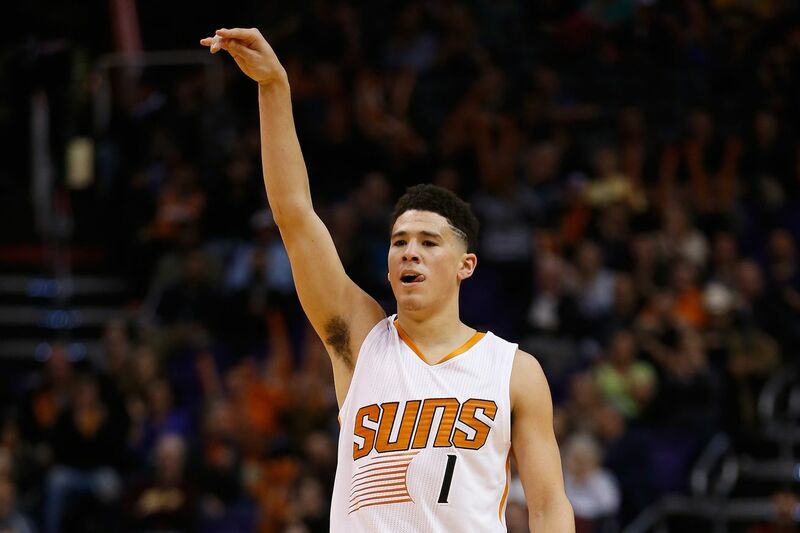 In addition, he became the youngest Suns player ever to score 30 or more points in a game. Booker now has five 30-point games in his rookie season to date. So, where does Phoenix go from here? Do they start three guards when all guys are back and healthy, or do they trade one to further build for the future? On the other hand, since the Suns don’t have any championship aspirations right now, Devin Booker is pretty fun to watch. So sit back and enjoy.